Mary Kenny: Is Your Uni Course Really Necessary? Life’s too short to fold a sock. Is calling trees ‘non-native’ a form or arboreal racism? A gala tribute to Edna O’Brien is altogether deserved. It was usually Irish families who consigned their daughters to homes for unwed mothers. But promoting a woman just because she is a female can be a wretched experience. 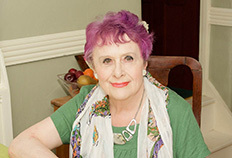 Mary Kenny is an experienced journalist, author and broadcaster working in England and Ireland. She has written for over 30 newspapers and magazines over the course of her career.